As I’m giving a Resolve class next week I thought it would be a good idea to update my shortcut cheat sheet to version 9. Blackmagic Design as changed a lot of shortcuts in the latest version of Resolve. 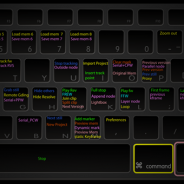 Here is the PDF to all the DaVinci Resolve 9 shortcuts mapped on a keyboard with associated modifier keys. I also did a 1920×1200 gray on black png to use as desktop picture. Feel free to print it, share it and frame it.